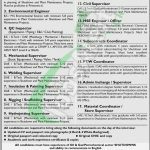 Appear for Descon Engineering Company UAE Jobs 2017 Walk-In Interview Date, which is the well-known company which is working since three decades is which is serving in the multiple fields of Engineering, Oil and Power is looking to hire the eligible, adroit, caliber and well disciplined applicants are required to apply for the multiple posts which are based on various shutdown projects in UAE such as (Area Incharge/ Area Engineer, Planning Engineer /Area Planner, Environmental Engineer, QC Inspector, Mechanical Supervisor, Welding Supervisor, Insulation and Painting Supervisor, Rigging, Scaffolding Supervisor, Hydrojetting Supervisor, E & P Supervisor, E & I Supervisor, Civil Supervisor, HSE Engineer/Officer, Subcontracts Coordinator, PTW Coordinator, Admin Incharge/Supervisor and Material Coordinator/ Store Supervisor) are the vacancies which needs to be filled this time with overall eligibility criteria of BS, B.Tech, B.E, DAE, Masters and Graduation Degree with the relevant filed touch expertise are required to apply with full confidence if you truly meet the whole criteria and demands of the said posts. Not only education but the applicants must be having the relevant several years expertise will be given preference. Attractive salary package will be given to the candidates. So, after having these details now let’s have a look at its applying criteria below. Candidates should appear for interview along with updated CV, passport size photographs 4 Red & 4 White Background, Original Passport and colored copy, Original CNIC & copy and copies of Academic and work experience certificates. The interview will be held on different dates in Lahore, Karachi, Rawalpindi, Multan, and Sadiqabad. At the time of interview original as well copies of relevant documents should be brought. The walk in interview will begin at 9:30 am to 5:30 pm. There is no any agent of this company so the candidates are advised to avoid to make any cash deals with any of the person who claims to be an agent. No accommodation facility will be given. Interview Date in Karachi: 19th September 2017. Venue of each city interview can be seen from the given advertisement image below.